A documentary series about the creative process of Flores & Prats architects for the restoration of Sala Beckett in Barcelona. Sala Beckett is a very special place. Its walls have witnessed a century of history by now, welcoming people in their free time. For a long time the building hosted a workers' club, the Pau i Justicia cooperative. Then, after its closure and subsequent abandonment, the building found a new life becoming the home of an experimental theatre company that chose it as its new home. Architects Ricardo Flores and Eva Prats were commissioned to restore the old building, adapting it for new theatrical uses. The web series "ESCALA 1:5" unveils the architects' intentions, shows how the renovation process actually took place, celebrates the emotional engagement of the people who now inhabit it every day. The five episodes of the series, available here, focus on many building components. Each component brings new life into the building while simultaneously welcomes memories of its past. The series "ESCALA 1:5" is the result of a collaboration where different ways of observing architecture have met and mutually contaminated. 15. L-Films, the producers, have been following Flores & Prats since a long time and have filmed many of their buildings and lectures. Directors Albert Badia and Patricia Tamayo, on the other hand, have recently approached the Spanish duo and contributed to observe their work with a fresh glance offering a theoretical and visual interpretation. 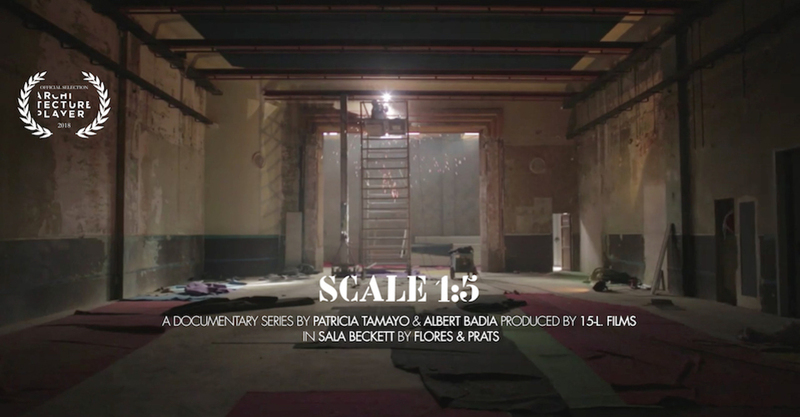 The authors and the producers filmed the construction site, interviewed the architects, and collected the comments of those who consider Sala Beckett their home. Balancing images and voices, they show how the renovation project has been molded on a contagious passion for theater and a relentless dialogue with the past.